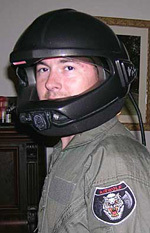 Steven W. Stull has been known to make a few Replica AIRWOLF helmets privately every few years or so when he has time. They can take MONTHS to make due to their craftsmanship and quality thus patience is a virtue. Alternatively, look on eBay as second-hand examples of Steven W. Stull Replica Helmets come up from time to time. Beware of cheap knock-offs though as there are a few pretenders out there. DISCLAIMER: Any potential private transaction is between yourself and Steven W. Stull only. Neither Mark J.Cairns, nor anyone else on the Airwolf Themes team has ANY direct input nor receive any fiscal benefit from any transaction. The Replica Helmets are only promoted here [in good faith] on behalf of Steven W. Stull as we're in awe of his craftmanship, but any and all funds will go DIRECTLY to him, as should all communication. Please E-mail Steven W. Stull directly with any questions you may have. My Airwolf journey has just BEGUN! I got the Helmet on Saturday and WOW! There is simply only three words that can describe the detailed work you did: Work Of Art! Your attention to detail, beautiful workmanship have made this experience one of the best I have ever had. ...You have gone to the extreme on the workmanship, and I truly appreciate it. To have a helmet from my favorite TV show is a dream come true for me. ... Before I forget, the US Post Office did manage to puncture the box with a hole the size of small fist. Fortunately the extra packing you placed in there shielded the helmet and everything. Your extra packaging saved it! Thanks again for the killer helmets. ... I was away and only got back this morning so I didn’t get a chance to see it until this morning. It is amazing! I'm really pleased with it. You really have put a lot of detailing in to it. There is no problem with it fitting on my head; in-fact I found it is huge. But that’s okay as I don’t intend on wearing it too often. I was especially pleased to see the additional CD and documentation which you sent. It was a very nice touch. ... Once again I would like to take this opportunity to thank you for everything. I just want to add a few comments of my own. PRICE: Sure, it's a lot of money, but if other fans buy one, I believe they will be getting their money's worth. Those of us who collect props and replicas have to accept that it's an expensive hobby. Most of the fan-produced replicas from other genres (Star Wars, Star Trek, etc.) are just as expensive but, they usually lack working functions and the accuracy of their details don't hold up under close scrutiny. 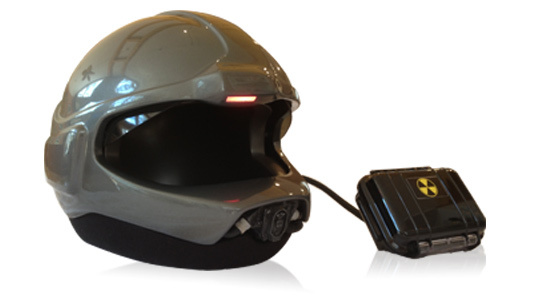 Airwolf fans at least have the chance to buy a fan-produced helmet made of great materials (fiberglass) and is fully-functional (if desired). HELMET DETAILS: Just like the other owners have said, the outer shell is made of thick fiberglass, painted and lacquered flawlessly. The finish is smooth and polished, nice and shiny. All the lines and surface details are sharp and crisp. INSERT: The insert is molded to fit perfectly inside the helmet. The interior of the insert is finished smooth, so it's comfortable surrounding your face and head. The insert is rigid plastic and extends past the bottom of the helmet to form the "collar." The collar is covered with high quality, black Lycra material. VISOR: Even though the visor is tinted and is round shaped, my vision doesn't get distorted when I'm looking through it. One quick touch of a button, and the visor lowers very smoothly and very quickly! Touch another button and the visor raises up in one smooth, quick motion. TRUST: All of us have those trust issues,especially when it comes to sending huge amounts of our hard-earned money to someone (we've never met before) over the 'Net. ... It doesn't matter if you go through a big "safe?" site like eBay, through the Airwolf Themes website or make a deal through personal e-mails. We all risk getting scammed and kissing our money bye-bye. I worried about it too because this is the most money I've ever spent on a collectible product. I read his posts on the Forums and he sounded like a decent guy. I never got the impression that he was hard-up for money or was just trying to get as many helmet orders as possible. ...Steven really showed me his integrity when he delayed shipping my helmet because he found some tiny flaws in the clear coat finish. He could have just shipped it to me "as is", but he said that he has high production values and since I was paying so much money, I should expect to get a perfect helmet. He actually disassembled the whole helmet, repainted and refinished it. That's why I trust Steven and I would buy from him again. ... Well, that's my opinion. I hope all of you get a chance to buy one of these fantastic helmets! ... I am the proud owner of a marvelous Airwolf Replica Helmet created by the hand of a very talented person named Steven. This helmet is a dream come true and looks totally AMAZING! ... I received the package this afternoon. perfectly packed; what can I say more than it is PERFECT. I received it at work and a lot of my work colleagues tried it on and found it great to wear. They don't know about Airwolf too much but still could appreciate the great work. ... When you know that there is only a few of them so far in the world... it makes it even more precious to my eyes. With all the pictures I had seen of your helmets, none can compare to seeing it in reality. ... I knew I had a big head, but now I know it is BIG because it fits perfectly on everyone who tried it at work... it fits me well too. ... I usually do not write to any forum, but this is worth the mention so I'll leave a great review on the Airwolf Themes Forum. ... THANKS A MILLION TIMES OVER! I have received Airwolf Replica Helmet four days ago. 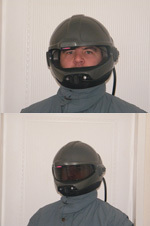 I'm very satisfied about the Airwolf Replica Helmet and your professional skill and finishing. I received the Replica Helmet today and I was highly and very impressed with it. I have to learn just to tag the visor buttons but, that will come in time. The quality, workmanship and the look is out of this world. In short, I cannot find the words to properly express how good this helmet is. All I need now is the Flight Suit to go with it! I wish to THANK YOU for the helmet, the CD with all the pictures on it and the note that was enclosed. Jenny and I took some photos of it and I am going to show them to others that like Airwolf and you may get a few more customers from that. Take Care and good luck in the future with your impressive craft of the Airwolf Replica Helmet. You have joined the ranks of the DaVinci's and Van Goghs; truly a masterpiece in its own right -- congratulations Steve! Fantastic packing job - was just like Christmas unwrapping it - no damage and everything functions properly.Thanks for the batteries and yes I'll have another when you're ready. I'll call you. Many thanks again. E X C E L L E N T! Bob was the Helicopter Pilot that flew the Bell 222UB used in the Don Johnson movie "Harley Davidson and the Marlboro Man". The helmet is GREAT. All of my comrades here [in the US Army] love it. We compared it to the ones we actually use in the helicopter. 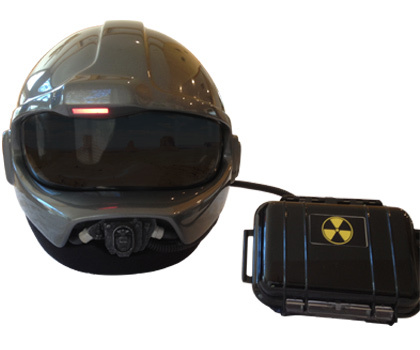 Surprisingly, the Airwolf Replica Helmet weighs nearly twice as much. Even when fitted with Infrared harnesses, comms equipment and lip light. I had one of our ALSE [Aviation Life Support Equipment] Officer to check and see if he could mold an interior that will fit it similar to the materials we use in ours. I like your idea [of special foam inserts] better. The inserts you are working on will look as though they were made for it. Innovation is not one of your weak points, that's for sure. Let me know how its coming along. Thanks again and great job! The Helmet is nothing short of incredible, beautiful, phenomenal, stunning... I can't think of any better words to use to describe this "work of art!!" The speed visor works incredibly smootlyh not to mention looks very cool when in operation. The finish is absolutely smooth too; this could easily have been used on screen as a "hero" prop for use in television or movies. This was well worth the wait! Thanks again Steve!